2013 Year in Review: 2,249 individual seal sightings were reported in 2013 for an average of 6.2 seals per day! Again, the tireless efforts of the volunteer network made this possible. The Hui identified 43 different seals including 2 pups that were born on the north shore last summer. 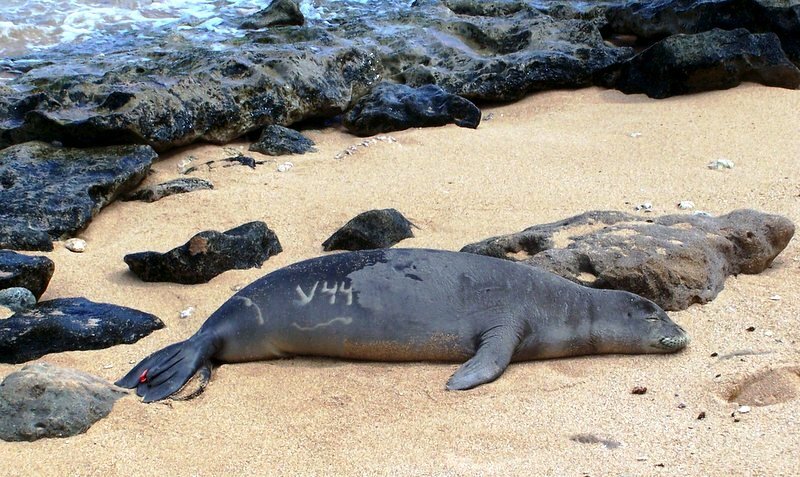 We also identified 6 new seals that made visits from nearby islands, perhaps from Niihau, Ka’ula and Lehua rock. 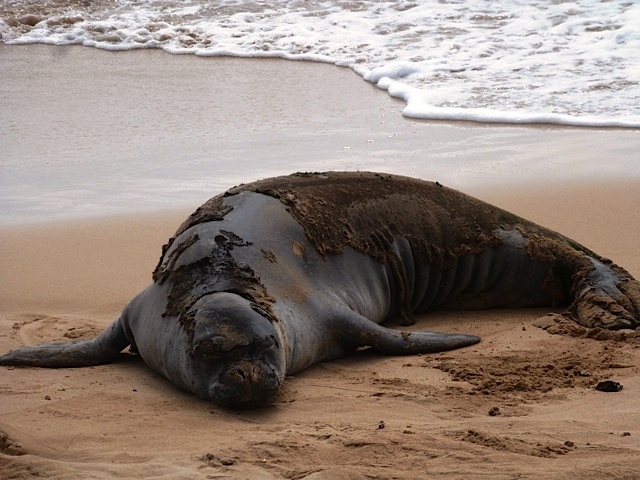 As reported previously, a number of seals were entangled with fish hooks in 2013. We are pleased to report that all seven hookings resulted in successful hook removal and recovery! Weaners (weaned seal pups): Close monitoring of weaned seals continued through the 2013 season and as this photo indicates, pup RN44 has successfully learned to forage on his own. His body condition would be rated as extremely healthy. He was also bleach marked (using common human hair bleach) with the identifier V44. These bleach marks only bleach the fur and last until the next annual molt. In the meantime, this marking makes identification by beach goers, spear fishers, boaters, and volunteers much easier, especially if these curious young seals exhibit problematic behaviors such as approaching spear fishers or swimmers. molt. Scroll down to learn more about this physiologically demanding process. RK31 is currently undergoing his annual molt as shown in this photo. 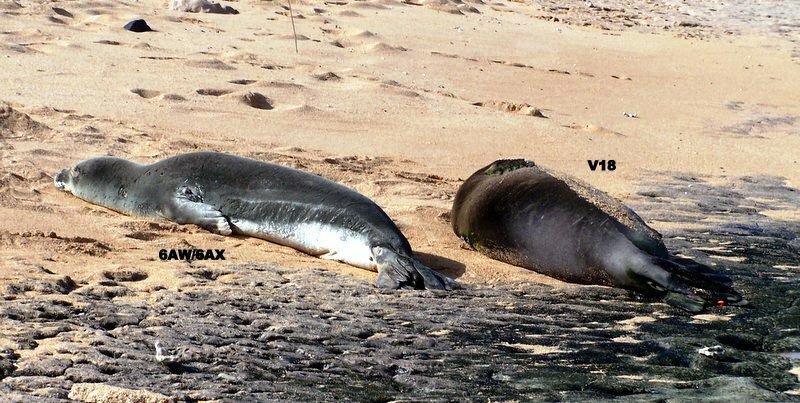 It is important to give molting seals space, so if you encounter a molting seal please encourage all beach users to “Let sleeping seals lie” or, in this case, molt! Unknown visitor: In December an unknown sub-adult male seal was sighted on the north shore and immediately reported by one of our lead volunteers. flipper tagged this seal as R6AW and injected a small microchip tag (just like the microchips dogs and cats get). After tagging, this seal spent the remainder of the day resting on the beach, departed that evening and has not been re-sighted since. Later, during photographic analysis of unique scar patterns, this seal was matched with photos from previous fieldwork in the Lehua Rock/Niihau area.